Peterborough Panthers’ season of pleasure and pain continued last night (July 13) - as another success came complete with another injury blow. The city team preserved their four-point advantage at the top of the SGB Championship by beating Scunthorpe 48-42 at the East of England Arena. Simon Lambert (blue helmet) and Scott Nicholls claimed a 5-1 in heat one for Panthers against Scunthorpe. Photo: David Lowndes. They led throughout a close contest but didn’t clinch victory until top-scorer Michael Palm Toft inspired a 4-2 in the penultimate race. That arrived moments after Panthers lost Ulrich Ostergaard following an awkward spill which left him suffering with back and rib pain and sporting a nasty shoulder wound. The Dane lost control leaving the fourth bend in heat 13 and clipped the fence before eventually tumbling off his machine having crossed the start/finish line. Team boss Carl Johnson said: “It’s another meeting ticked off and another victory on the board. Michael Palm Toft in front in heat five of Panthers' win over Scunthorpe. Photo: David Lowndes. “We knew it would be close as Scunthorpe have a lot of guys who rode well at our place and we don’t expect to be annihilating teams every week. “We want entertaining racing and we want our boys to know they’ve been in a tough meeting - and we got those things last night. “Everyone contributed points and everyone had at least one paid win which is good to see and highlights the strength we have through the team from one to seven again. Tom Bacon in front for Panthers against Scunthorpe in heat two. Photo: David Lowndes. Number one Scott Nicholls and captain Simon Lambert gave Panthers the perfect start with a 5-1 in heat one although it was a close call due to a late thrust from Scorpions guest Aaron Summers. One full house was quickly followed by another as reserve duo Tom Bacon and the returning Emil Grondal - back after seven weeks out - breezed clear to dominate the second instalment. Referee Peter Clarke ruled an unsatisfactory start to heat three following a big first-bend bump between Bradley Wilson-Dean and Jake Allen – even though both riders remained upright. The race was successfully completed at the second attempt although it had an unsatisfactory result as far as Panthers were concerned as Palm Toft and Wilson-Dean were on the receiving end of a 5-1 from Scunthorpe pair Allen and Summers. 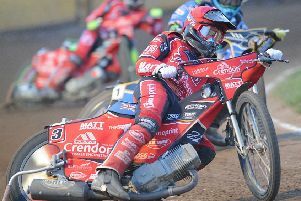 The visitors also provided the winner of the fourth contest as Josh Auty – the highest-scoring rider on show with a 14-point haul – also proved to be the fastest when enjoyed a runaway triumph in a sub-60 second time of 59.9 before Palm Toft the flag in another shared race. Skipper Lambert continued his fine rise into the main body of the Panthers’ team with a smart success over Auty to inspire a 4-2 for Panthers in heat six, but they were stung by a 5-1 by Summers and Allen in the following race as their lead was cut to just two points. It stayed that way following a shared eighth battle in which Auty triumphed after forcefully shoving Lambert towards the second-bend fence as he attempted to sweep past on the second lap. It was a ruthless move which clearly left the Panthers skipper unhappy as he confronted Auty as the riders stepped off the bikes following the race. Auty was put firmly in his place in heat nine, though. He was powerless to prevent Wilson-Dean and Palm Toft powering to a welcome 5-1 for Panthers before Nicholls and Ostergaard won shared races to maintain a six-point advantage. The Dane squeezed through the smallest of gaps in heat 11 and then succeeded in keeping Scunthorpe tactical substitute Allen at bay and the Panthers’ lead grew when Wilson-Dean continued his upturn by blasting past Summers to triumph in a 4-2 in the next race. Reserve Bacon tucked in for third spot to takes his personal return to 7+1 during another pleasing shift at the bottom of the order, but Panthers saw their advantage halved when Nicholls was on the receiving end of a 5-1 from Auty and Worrall in the re-run of heat 13 after Ostergaard’s spill and exclusion in the initial staging. They recovered quickly to seal victory in the penultimate contest when Palm Toft’s victory and Grondal’s third place ensured a 4-2 and Palm Toft then made it a quick double by streaking clear in a shared finale when Wilson-Dean was left at the back despite trying everything to pass Worrall. It was an outcome which meant the visitors departed with a consolation point (with a firing reserve they may have got more but Danny Phillips and Gino Manzares only managed a point between them) but that was of little concern as Panthers remained in pole position in the standings. They will look to strengthen their grip at the summit tomorrow (July 15) when entertaining reigning champions Sheffield in another East of England Arena outing (5pm start). They have booked Scunthorpe man Allen to guest for the injured Ostergaard. PANTHERS: Michael Palm Toft 12+1, Scott Nicholls 8, Tom Bacon 7+1, Simon Lambert 6+2, Ulrich Ostergaard 6, Bradley Wilson-Dean 6, Emil Grondal 3+1. SCUNTHORPE: Josh Auty 14, Jake Allen 12+2, Aaron Summers (guest) 9+2, Steve Worrall 6+3, Danny Phillips 1, Gino Manzares 0, Rider replacement for Stefan Nielsen.